This is light and fresh stir fry that comes together so quickly. There are no veggies to dice, no chopping except a quick slice through an onion. I used snow peas and shredded carrots because they can go in straight from the package — saving me time on a busy week night. With those shortcuts, this meal is on the table as soon as the rice is done. I use the boil-in-a-bag kind because I can throw it in without measuring anything and boom it’s done in 8-10 minutes. I use that 8-10 minutes to prep the meal and then we can all eat as soon as the rice is ready. This is not a dark, teriyaki stir fry — it’s a lighter, slightly sweeter, hint of lemon-y stir fry. Really light and fresh (and perfect if you’re trying to eat a little cleaner). While rice cooks, drizzle olive oil into a large saute pan or wok and heat over medium-high heat. Add chicken, snow peas, and onion to hot skillet, and stir fry until chicken is mostly cooked and onion is tender. Add carrots and cook for 1 minute (you want these to stay crisp). Whisk together soy sauce, ginger, lemon juice, brown sugar and corn starch. Pour sauce over chicken, stir to coat, and continue cooking until chicken is cooked through and sauce is thickened and shiny. 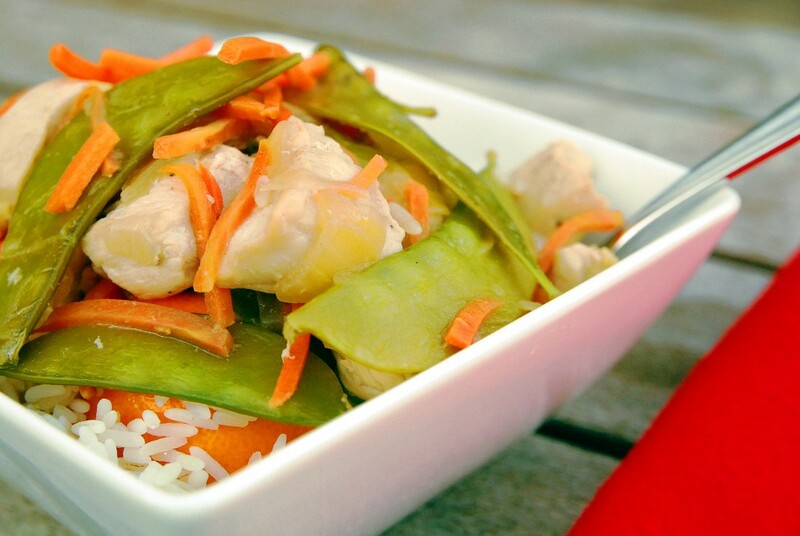 Scoop rice into bowls, and serve topped with chicken and vegetables.